It’s as simple as that! If you are unsure about exactly what is involved then read on. After your big day you may forget about your dress until you get it back out to reminisce. After the wedding remember to take your dress to be dry cleaned as soon as you can. Taking your dress as early as possible catches any stains before they set in to the fabric. 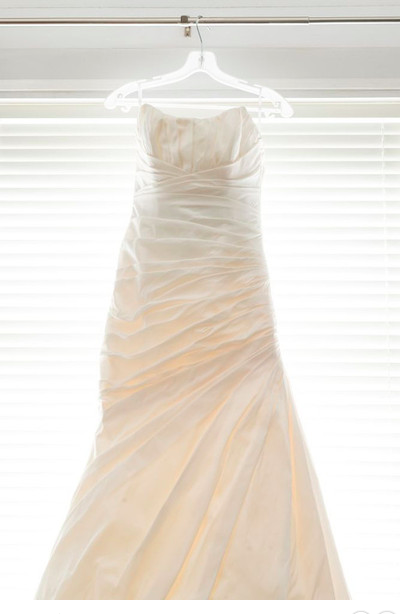 Make sure you find somewhere that handles wedding dresses, as they are not like regular items of clothing. The delicate beads and details can get damaged if not handled correctly when dry cleaning. Some stains may not be visible until later and having the dress dry cleaned will ensure it can be stored away in the best possible condition. Invisible stains from drinks like lemonade & white wine can appear later and cause a browning and we all know how bacteria can multiply! Lay out the wedding dress ready to be folded neatly in to the storage box. Use tissue to wrap & layer between each fold of the dress. This will cushion the folds and creases and keep the dress wrapped safely. Becareful which tissue you choose! 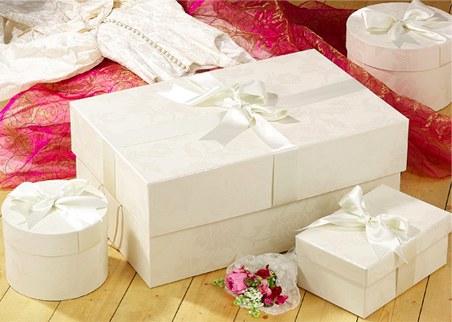 Don’t just wrap your wedding dress in any tissue paper. - If the tissue is coloured then the dyes in the tissue can bleed out over time & transfer on to your dress causing a stain. 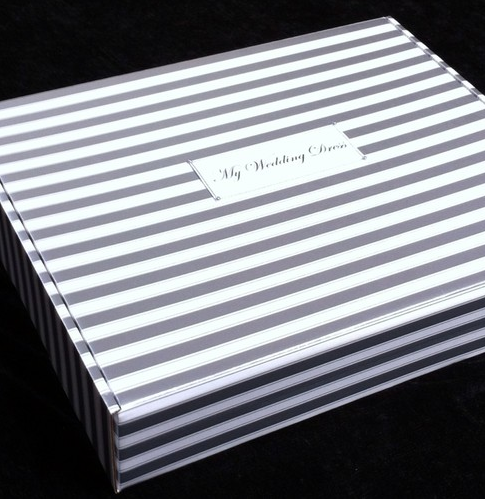 The pretty dotty tissue may look fab but not for storing your wedding dress. - Many regular types of wrapping tissues contain acid in the fibers and therefor are not suitable for long-term storage either. Double check the tissue is acid free. Don’t use a Plastic dress cover. Not for long-term storage. So what kind of box are you going to use? A pretty one with ribbons & lace to match your dress, a patterned vintage style or a strong sturdy one? Don’t use an everyday cardboard box. - The box may not be built to be durable enough. Imaging the worst-case scenario of a flood or accident. Don’t store your dress in a regular wooden box or draw. Why cant I Keep my dress hanging. Keep your dress from the elements such as heat, light and damp. Store the dress in a warm dry spare room, which has no history of insects, instead of an attic. 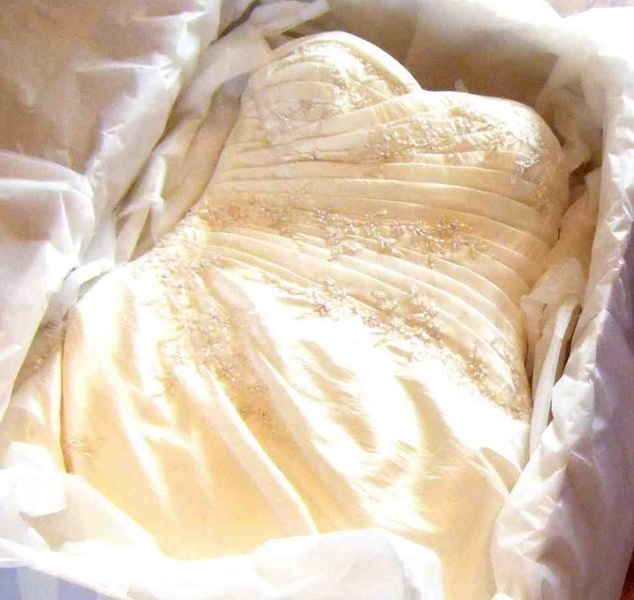 Once packed away, check on the dress every 6 – 12 months to ensure nothing untoward has happened, and repack e.g. once a year to help prevent creases becoming too permanent.